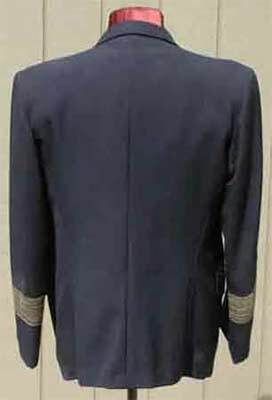 Dark navy blue double breasted, three pocket jacket. The fabric is ribbed and might be a cotton-rayon blend. The national eagle is made from about five kinds of multi-colored gold and silver celleon and metal bullion on a wool base. The miniature ribbon bar is sewn on and shows seven awards, five with crossed swords, a highly decorated WW1 veteran. 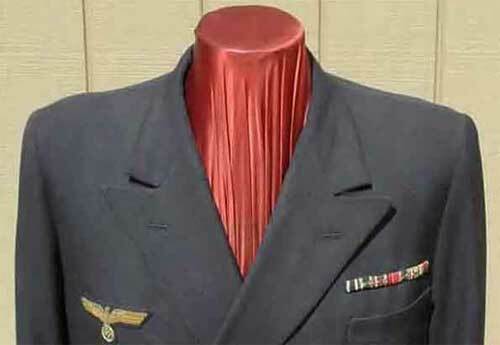 The buttons have been moved over about 2 inches indicating the captain lost weight as he got older. 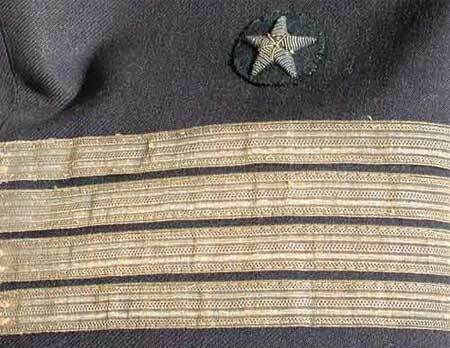 The four bullion stripes and star on each sleeve show light wear and tarnish. 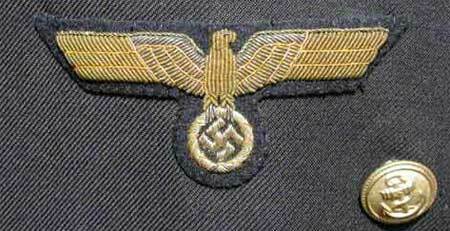 The metal buttons come from many different makers and the underlying thread shows they were all lost and replaced a number of times. The two inside and three outside pockets are all lined with black rayon. The sleeves have an off white rayon lining with blue and brown pinstripes. 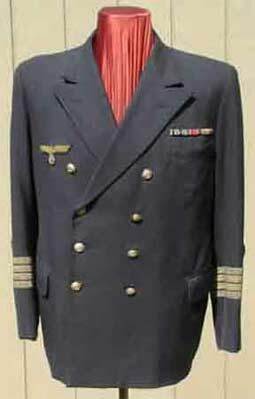 The jacket is lined in black rayon. The makers label looks like silk, is machine woven, and starting to fray on the edges. 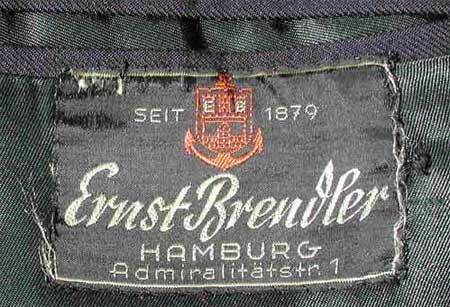 There is no name label sewn inside the pocket. The collar has a quilted wool lining. I can see no evidence of staining, moth damage, hole or tear repair. The overall condition is very fine.